For the ninth time in 2 hours, I tell my oldest son to change the litter box. For the 5th time in as long, I tell our oldest daughter to load the dishwasher. Lost count on how many times our youngest son has been told to take the dog out for a walk and for our youngest daughter to gather the dirty laundry. The litter is PASSED time to be changed and I’m PASSED tired of looking at it, smelling it, dishes are piled, over flowing the sink, the dog is cross eyed needing to go “out”, and the dirty clothes are mounting in every room. I feel like I’m wasting my breath telling them what to do. Tired of hearing, “Wait a minute”, “I’m fixing too”, “Why do I have to do it?” It’s their chores and everyone has their own to do. If everyone doesn’t pull their weight and get their job done, the total picture doesn’t come together and leaves the door open for chaos and Momma feels LOTS of stress!! As an adult, there are a lot of things that I don’t want to do. I don’t WANT to put gas in my car when it 12 degrees outside with the windchill below 0, but if I don’t, I will not be able to drive it. I don’t WANT to work six days a week morning until dark with NO pay, but I have to because we can’t afford to hire anyone. I don’t WANT my husband to have to work 3 jobs because I feel selfish and want to spend time with him for myself at times, but we have bills to pay and 4 children to feed and cloth. I don’t WANT to stay up to almost midnight sometimes, folding laundry, but I have to, because that’s the only time I have to do it. We make sacrifices in many areas of our lives that our children and other people will never see or never, ever know about. The sacrifice of sleep to get things done, the sacrifice for personal time or things for yourself so that they can benefit from it. Sacrifices for your church family, outside/public organization, etc. The One that does see and knows every little detail, is God above and that’s all that matters. My strength comes from Him and He will help me get through each day and every “I don’t want”. It may even seem selfish or petty to others and there may be others out their who know exactly what I’m talking about. Therefore, until you’ve walked a mile in someone else’s shoes, or spent time with them and watch ALL THAT THEY DO, please don’t judge their “I don’t want to”s, just be glad that they make the sacrifice and do it anyways, sometimes, it’s so that you don’t have to. Being raised in church all of my life, there are some “trainings” that we take for granted. 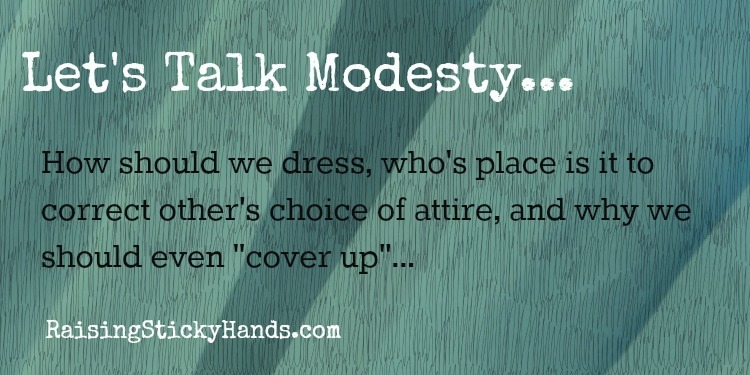 Just because I was taught modesty, doesn’t mean that everyone else has been given this lesson. I have been trying to instill into my children, that if someone visits our church dressed “differently” than we would dress, that they may not know better, not to judge them, and if they commit themselves to God, He will show them the proper way to dress in public areas. When you dress modestly, you are not show-y as in “look at me! Aren’t I cute?” You have all of your “parts” covered. Some girls don’t leave anything to the imagination. Dressing nicely and “looking all good” isn’t thrown out the window. Confidence is a good thing, just don’t let it turn to vanity. Some Christians have “made it their place” to tell others what they do and how they dress is wrong. That’s not what we were called to do. God has to do the convicting. When this type of person comes into your church or home, etc., just love them. Our duty is to show Christ’s love to others. the quality of being modest; freedom from vanity, boastfulness, etc. regard for decency of behavior, speech, dress, etc., simplicity; moderation. This is a great rule of thumb as you get dressed for the day. Unless you’re just going to lay around or stay at home for the day. Then, order calls for a Muumuu! Comfort by all means!